The easily applied Leukoplast Leukosan Wound Closure Strips (Pack of Nine) allow for the closure of cuts and wounds without the use of a dressing. Offering sterile and pain-free wound closure, Leukosan Strips are suitable for fragile or sensitive skin. 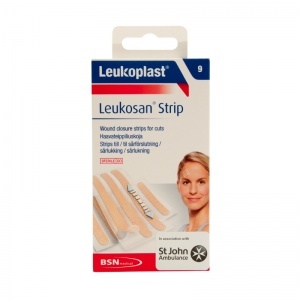 Sold in packs of nine with separate strips of two different sizes, the Leukosan Strips allow the wound to heal without harming the surrounding skin. The sterile, dressing-free Leukosan Wound Closure Strip offer pain-free wound closure, ideal for sensitive skin. The breathable fabric of the Leukosan Strips suits thin or fragile skin. Easily applied to the wound area, the Leukoplast Leukosan strips are safe and sterile, offering low risk of infection in comparison with traditional plasters. The versatile strips can be used in a variety of methods and offer clean and easy wound protection. The Leukoplast Leukosan Wound Closure Strips (Pack of Nine) are usually dispatched via First Class Royal Mail and delivery should be within 1 to 3 working days.